This limited-mintage special edition double-incuse bullion coin celebrates the Silver Maple Leaf 30th anniversary of mintage. The Royal Canadian Mint released its first Silver Maple Leaf bullion coin in 1988. As with the Gold Maple Leaf bullion coin, released 10 years earlier, the Silver Maple Leaf became one of the world’s most innovative and sought-after bullion coins. It has been 30 years since the RCM's popular Silver Maple Leaf (SML) bullion coin made its debut, yet the sophisticated simplicity of its now-iconic design continues to strike a chord with coin enthusiasts and investors everywhere! The classic Walter Ott-designed maple leaf on the reverse of this Silver Maple Leaf bullion coin gets a unique look thanks to incuse striking that sinks the image into the field. But an extra-special element makes the coin a Royal Canadian Mint first: the obverse image of Her Majesty Queen Elizabeth II is incuse struck as well! This beautiful treatment gives pride of place to both Canada’s beloved maple leaf and Canada’s beloved monarch. 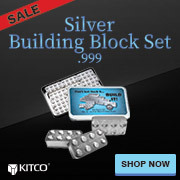 Why buy Silver Maple Leaf Incuse Coins from Kitco? The Silver Maple Leaf Incuse Coin(s) you receive may not be in absolute mint condition.